Camera straps should be 5-6mm cord for over-the-should camera cases. Rappel from this material first. 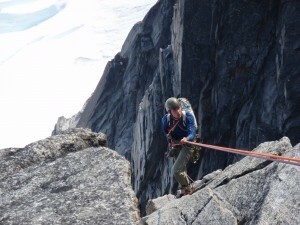 Belts should be thin webbing or cord you can rappel from. Tie your chalk bag around your waist with 1 or 2 wraps of thin cord, and then don’t be stingy about rappelling from it. Tie a small loop of cord or webbing through the top (“haul”) handle and through the shoulder strap of your backpack. Clip it into belays with this point, or repurpose this to rappel form it. Rap Rings – I used to carry some of these. I still have a few clanking around amid the clutter of my odds-and-ends box. When I’m looking for my missing offset wire or hibernating v-thread tool, I see them and wonder what I was thinking in buying them. Unless I am going climbing with the explicit purpose of creating a permanent and popular rappel station from atop a trade route, the rap ring stays in the garage. If you are making a new rappel station, just rap off cord and rotate the piece to spread out wear. If you are bailing off a cam or wire, you’ll want some cord or a carabiner to sling through the gear, not a rap ring. If you are backing up an existing station, just cut away everything except the one best sling, and add your new one without a ring, or else through an existing ring. If you’re a guide who wants to spruce up the anchors used every day in getting off the “Beckey Route”: Thanks! For you, rap rings make sense!